Do you like heavy, sludgy, muddy, crushing music? 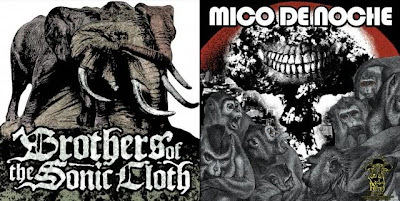 Well, as promised, here's the recent Brothers of the Sonic Cloth split with Mico De Noche. This is heavy as hell and was only released on 10" vinyl format - needless to say it is very limited edition. The track "Fires Burn Dim In The Shadow of the Mountain" is a 12 minute crushingly satisfying, sludgy epic and the Mico De Niche tracks are just as deliciously heavy. I'm thrilled to have possession of this on MP3 format as this is one of the greatest doom related (or actually any genre) releases I've heard in quite some time so now you can enjoy it as well.. and enjoy you shall. DL: "BOTSC/Mico De Noche Split"
Can you reupload this please? The link is down. Album: Gas Huffer: "Just Beautiful Music"
Album: Chris Eckman: "The Black Field"
Album: Nick Oliveri - "Death Acoustic"
EP: God Bullies - "Plastic Eye Miracle"
Album: Burning Witch - "Crippled Lucifer"
Album: Litmus - "You Are Here"
EP: Tad - "Salt Lick"
Single: God Bullies - "Tell Me / Creepy People"